Okay, I'm cheating here. This picture wasn't taken today (or even yesterday), but a couple of weeks ago. But my mom did make us fresh pitha last night, and we ate them hot off the pan. What did we do today? We went to visit my niece, as I said (and her parents, but they're barely important). After running away as soon as she saw us and being enticed to show herself through the offering of a gada (which was the only gift she had asked for when I asked her on the phone on her birthday what she wanted), she then condescended to play with us all afternoon, chatting away comfortably to the Guy in Assamese oblivious that he couldn't understand her. 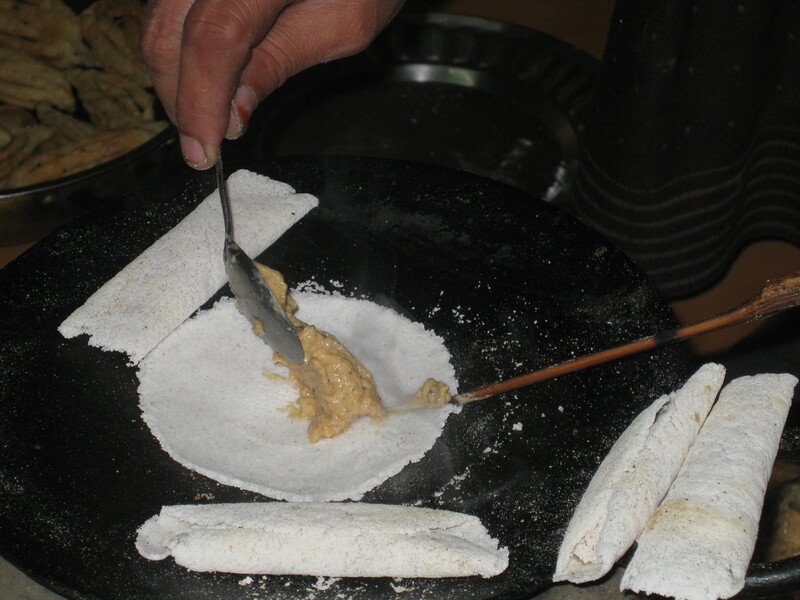 The pitha looks yummy! What is the filling? Your niece must be bewildered by the nice uncle who doesn't understand her words! Carpe Diem! : Oh, mine's been talking for ages now. She used to talk on the phone even before we saw her at all. Dipali: Sorry sorry, put it up now. Quite forgot about it in all the excitement. No pic today, then: I have work to do still and am too tired and the niece is on her way over (children are tiring!). The traditional filling is ground sesame or coconut sweetened with sugar or jaggery: this is my mom's special concoction of (mainly) milk and sugar.